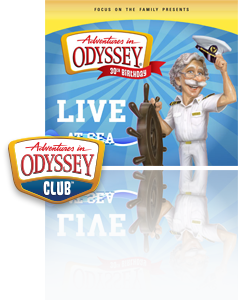 Jump on Board for the Adventures in Odyssey 30th Birthday Live Show! If you weren’t able to go on the Focus on the Family 40th anniversary cruise last November to experience the celebration of 30 years of Adventures in Odyssey, the fun has now come to shore via the Adventures in Odyssey Club. Members of the club can now watch the live show as it was performed on the cruise in its entirety. On Nov. 15, 2017, a capacity crowd filled the largest theater aboard the Disney Dream to celebrate Adventures in Odyssey’s 30th birthday. That live cruise show was a blast. You had to be there to see it . . . until now. As a Club member, you have exclusive access to the entire performance right now in the album library! Experience all of the skits, music, laughs—even Foley effects performed live by AIO sound designer Christopher Diehl. Others appearing onstage included Katie Leigh (Connie), Will Ryan (Eugene), Jess Harnell (Wooton), Andre Stojka (Whit), Townsend Coleman (Jason), Shona Kennedy (Jules) and Phil Lollar (Dale). You’ll also enjoy special appearances by Chuck Bolte, host Chris Anthony, the Westcott Girls and our 2017 Get in the Show winner, Grayson Smith. Running at approximately 1 hour and 15 minutes, the live show is filled with humor fans have come to know and love during the show’s 30 year history. The show is also reminiscent of times past, which we’re sure you’ll recognize. Login or start your 14-day free trial at aioclub.org. Are you a member of the Adventures in Odyssey Club? Did you get to attend the cruise last year with your family to celebrate? Sound off in the comments below!